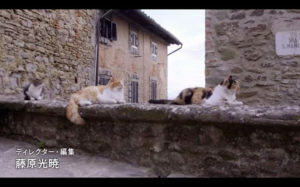 The medieval town of San Gimignano was temporarily taken over by cats during last August and September as part of a visiting Japanese documentary series called “Wildlife Photographer Mitsuaki Iwago’s World Cats Travelogue.” The series captured the cats of San Gimignano in their picturesque Tuscan hometown and aired in February, 2019 on the Japanese broadcast channel NHK as well as Facebook. Iwago is a renowned Japanese wildlife photographer who has specialized in shooting cats since his early twenties. He now travels the world to shoot cats from various different cities and towns in an effort to emphasize the connection between a city and its inhabitants, both human and feline. While San Gimignano is an ideal location for any film endeavor given its landscapes and 13th century architecture, the series focused more on the town’s cats in their natural surroundings as a way to better understand people. The cats were not chosen at random though and the municipality of San Gimignano had to organize a casting call.